How do you immerse students in the ocean? Start with the classroom environment, of course! 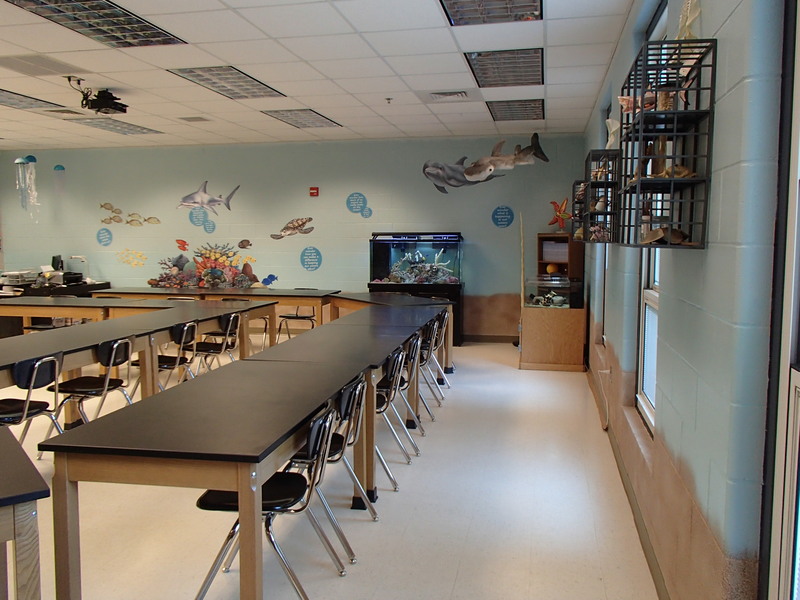 As a Marine Biology teacher, there is so much to immerse the students in throughout the school year’s curriculum! But to give them an immediate and ongoing feel of visiting the ocean everyday, I decided to transform the classroom into an ocean oasis. I enlisted my students in the design of the ocean oasis — and that in itself was an incredible show of their learning. Ideas flew, sketches were drawn, and the ultimate melting pot of ideas gave rise to a design beyond my wildest dreams. With the principal on board with our design, an interactive classroom was born! While the mural on the wall fools the students that it’s painted, it’s a collection of individual wall decals! It’s amazing how the ocean atmosphere gets students curious and engaged before a single lesson begins It draws out interest and curiosity of even the shiest students. And isn’t curiosity what science is all about? Next Post Dive Deeper: Sea Stars!